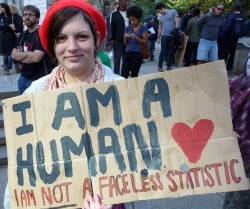 September 17 marked the 2nd anniversary of Occupy Wall Street. Activists from all over New York City and across the country eagerly waited in line to enter the birth place of the movement, Zuccotti Park. But, for those activists holding signs mounted on cardboard tubes found that they could not enter the sacred space and were held outside the park perimeter by private security. This arbitrary rule did not deter the activists from going on with anniversary celebrations. A couple hundred Occupiers and allies joyfully marched to McDonald’s fast food restaurant, across the street from Zuccotti Park, to call for a minimum wage increase. Fast food strikes have been gaining momentum across the country with workers and activists occupying Subway sandwich shops or picketing outside Church’s Chicken. Eventually, the marchers made their way to Wall Street and back to the park for a press conference. In true Occupy spirit, the day’s celebration continued on with more marches and creative actions, during which three men were arrested. CODEPINK/Women Occupy turned out for the 2nd anniversary along with legendary feminists Jo Freeman, writer & photojournalist, and Margot Adler, NPR correspondent. 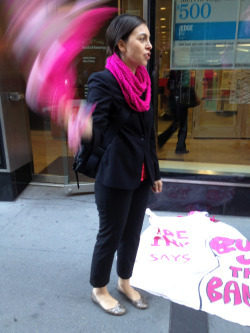 Women Occupy was developed by CODEPINK and women in the OWS movement to provide a safe space for women to organize and speak out for equality and economic justice. 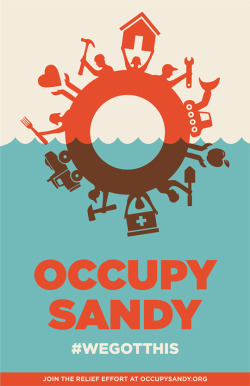 Listen to Margot’s NPR report on the 2nd anniversary of OWS. The day of protest culminated in a Robin Hood Tax rally and march across from the United Nations. The Robin Hood Tax is a campaign and movement supported by over 220 million people in 25 countries who are requesting a small tax on Wall Street big wigs and restoring vital needs for the 99%. Before the march stepped off, AIDS activists engaged in an act of civil disobedience, blocking a major intersection during rush hour. After the activists were arrested, thousands marched through the streets of New York City, stopping at JP Morgan/Chase offices and wrapping up at Bryant Park. The second anniversary is as important as the first; the movement has made it two years, yet college debt, monetary inequality, war and greed are still the norm. The second anniversary of Occupy Wall Street was an opportunity to get out of the comfort zone and hit the streets for peace and economic justice! 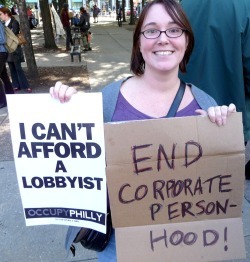 This entry was posted in Uncategorized and tagged #occupywallstreet, #RobinHoodTax, #S17, nyc, OWS. Bookmark the permalink.